With these tweaks, you can go from hitting the power button to seeing the desktop in under 5 seconds. Link and info for the Intel 660p SSD are for the 512GB model NOT 1TB, $99 was too good to be true! you know, I put an 850 evo in my kids asus laptop at it boots as fast or faster with fast-boot. we hit the button and it's almost instant. he loves that stupid laptop. when he got it, it had a 5400 rpm in it... lol, he hated it. i could not believe it once I installed the ssd and windows 10 fresh. I was stunned. i did a bunch of timings with my stopwatch, not that accurate but still, 3-5 seconds boot to usable is amazing. How you calculated the starting up time? Does booting from a Win10 VM stored on a RAM Disk qualify? Yes. You qualify because you used a combination of Hardware and Software. Albeit, non-traditionally. Great article. Somethings I can try to speed up my boot times, although I typically leave my PC on 24/7. In the first table of boot times is the third place drive the 970 EVO or 970 PRO ? Although the NVMe drives are measurably faster, I have to say that most users (like me) aren't really going to notice the 1-1.5 second reduction in boot time. If I'm that much of a d****bag that I'm going to complain about a SATA SSD taking 6-7 seconds to boot vs. 5 seconds for an NVMe SSD, I just need to keep my opinion to myself. I don't think booting a VM should count. It's from hitting the power button to Windows desktop appearing. There's little or no POST time on VMs. Isn't this typical? I can't say I go around measuring my boottime because it hasn't been an issue in years. I have a laptop with a core i7 and SSD and it's ready to log me in just moments after I pressed the power button. These days the problem seem to be more trying to get into bios setup screens, safe modes, boot network, book usb and so on because it all flies by so fast. Crunchbang: Hold my beer and watch this! 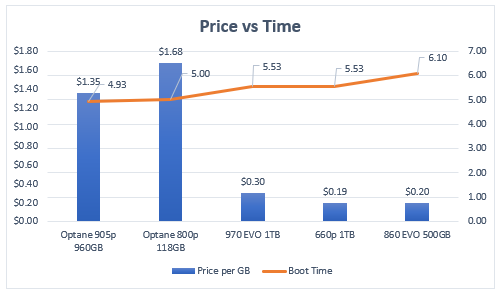 Numbers like this provide a good look into how little Optane, or even the NVMe drives, really benefit over standard SATA III SSD. The uber fast Optane is only 1.17 sec faster than the garden variety 860 EVO SATA III. But at 7x the price. The 970 is only half second faster than the 860. My system already boots in about 6 seconds, which is more than fast enough. Making it boot 1-2 seconds quicker is going to make no difference in my life whatsoever, so really not worth spending on. I currently have a Samsung 860 evo SSD. pick USB from list, PC will restart and boot from USB. what do you mean by Boot network? 970 EVO is the third in the chart. The 970 PRO is just slightly faster. I just read the article 3 times and either I fail comprehension or the article fails to mention how the times were calculated? Had to find it in the comments? OK to be fair it ONLY calculates Windows boot times but motherboards vary greatly in POST times. Brand new install of Win10Pro on Samsung 840 Pro booted to internet access in 8 seconds. After almost 5 years worth of additions to the startup, things like Cam, One Drive, Dropbox, Office, Adobe software, Steam bootstrap, nvidia drivers, RealTemp, AV, Malwarebytes, CCleaner, 7-Zip and some few more assorted apps and drivers, that same boot process now takes 23 seconds to get to internet access. Welcome to the Real World. 4.5 seconds would be nice but will only last for a few minutes, right upto the point where normal usage apps, programs, drivers all get involved. Does windows 10 have the wait for animation code like windows 7? I know windows would wait for the loading animation to complete one cycle and you could disable that. I'm going to guess that was in reference to PXE Booting into a WinPE environment. Even then, it's both extremely slow, and not even the full Win10 OS. So either way, it wouldn't qualify. Your monitor can actually slow boot times. My dell 4k adds about 6 seconds compared to just my Samsung 4k! Monitors slow to wake delay the boot process.